You won't believe this, but I have been asked to do a weekly guest post on a new blog! I am so excited! I will get to share a corner of the blog stage with an AWESOME and accomplished writer, who happens to be a great friend and a MIGHTY WOMAN OF GOD! I am excited beyond belief! More details to come SOON! Please pray for me, and for my friend, as we earnestly seek God's purpose for us in this ~NEW~ season of our lives!!!!! 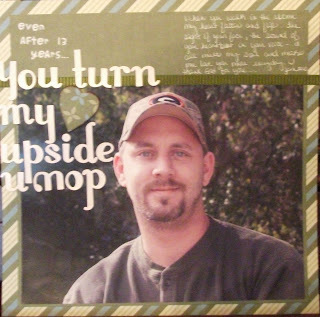 This first layout celebrates the game night traditions we have around our house. 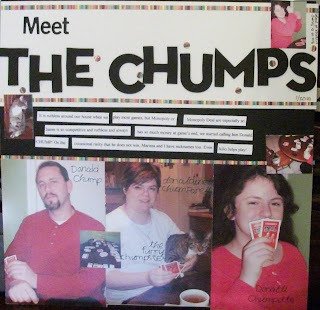 Since Jamie is so money hungry in his gaming, he earned the nickname Donald CHUMP. For future reference, I printed a small pic of The Donald and a brief bio of his wealth and success and secured it to the back of a layout. Sure everyone knows his name now, but in 50 years? Maybe not. Marissa and I also earned similar nicknames which are used on the very rare occasions we win. Of course Julio has to be a part of EVERYTHING so he gets to play the game too. Oh yes, my sweet obsession. 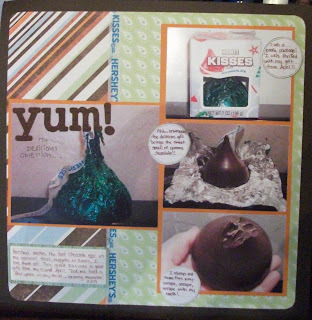 I have always loved a Hershey's kiss, and I had to document my sweet obsession with this sweet treat. I had inspiration and used the actual flag thingie to make the "hershey" ribbon on my page. Inspired? Maybe. Cheap?You betcha. Ah yes.....my handsome husband. My gift from God. The fabulous father of our daughter. The spiritaul leader of our home. And best of all, he is my very best friend. Of course I used PageMaps sketches for these, but everythign else was my own brainchild. Scary huh? Oh my goodness! I was so shocked and honored when I read Moira's comment on my post "A Friend Indeed". I wrote the post straight from my heart, describing the pain my daughter was going through with middle school girls, and somehow she read my blog and decided it was worthy of being used as devotional materials at her school. Through my squeals of delight I read Moira's profile, and learned that not only is she an avid and talented scrapbooker, she is principal of a Christian school in AUSTRALIA! Less than one week ago, a very wise person prophesied over my life. She spoke words of life over me, and the thing that hit me hard was that "my creativity and writing would be used to reach many souls for the Kingdom". She went on to say that this was only the beginning, and that what was about to happen in my life was going to be huge. Moira's email kind of takes on a different air here doesn't it? When I went through my Tres Dias weekend, our theme was "Such a Time As This". The leader of my weekend contacted me after seeing my post about this on facebook and reminded me of one of our songs that weekend, with lyrics that said "If you say go....I will go". The same friend who prophesied over me last week told me recently that I would go to the nations. We speak to nations, fall on your knees. We speak to you BE FREE." In my Christian walk I am constantly reminded of the freedom I received in Christ simply by being obedient to His loving invitation and accepting Him into my heart. He has turned all of my baggage into joy, removed my pain and yes, so importantly to me is He removed all my shame. Now I can walk with my head high, facing the world, and showing His love. So whether you are reading this is podunk Georgia or on the other side of this great world, I want to remind you that the love of God is reaching all corners of the darkness in our world. He loves YOU, and His arms are waiting to hug you and tell you what you mean to Him, and to help you get rid of all your junk that is weighting you down. So be free....and run to Him. It's just that simple. And you will never regret it. My delicious obsession is Hershey's chocolate. I know there are many fine chocolates from all over the world, but my favorite, hands down, is Hershey's chocolate. And I will take that plain please, no Special Dark, no Krackle, no almonds or peanuts added. Just pure, smooth, delicious Hershey's chocolate. I have always loved getting one of those big gigantic Kisses as a gift. I never buy one for myself, it seems it would lose it's magic that way somehow. 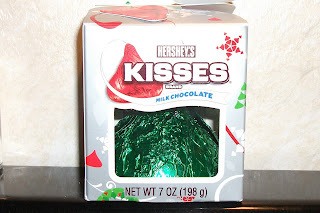 Next I unwrap the kiss, smooth out it's paper flag thingie and uncrinkle the beautiful shiny foil wrapper. Then I pick it up and start scraping off the top with my teeth,. Sick.....I know......but I have done it that way since I was a kid and I see no reason to stop now! 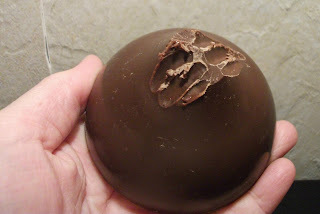 Today I took photos of my beloved Hershey's Giant Mondo Kiss......as I systematically destroyed a little of it. Then I carefully wrapped it back up in it's foil, placed it back in it's box, and hid it in the back of the top shelf in the fridge. UPDATE: Today we had a conference at school, and my daughter was move immediately into another class. She is now with two kids she has known almost her whole life,, in a class without cliques and powerful girls. PRAISE GOD! The amazing thing is that He had it all worked out before we even asked for help. Isn't God good that way???? Lately, my daughter has had some issues with "mean girls" at school. Who knew middle school girls were so brutal???? They tease her and exclude her and say mean things about her shoes and lanyard and lunch box. (They wear uniforms, so they have to find other things to harass her about) This has been going on for a while, and over Thanksgiving break her closest friend in her class dumped her (by text message even) for not being cool enough to hang out with. However, my daughter has recently discovered a great friend at church. He is a really sweet kid, a couple of years older than my daughter, raised in a single parent home by a Godly mom. He asked his mom what was wrong with my daughter, what was going on, and his mom told him. He began texting her, telling her how he thought she was so cool and that the other kids didn't see what was really there in her. Then he had her begin looking up scripture verses about how she is so perfectly made, how she is unique and beautiful in God's eyes, and how she is created in God's own image. A complete turn around is taking place. Yesterday I was fixing my hair in my bathroom, and my daughter was in her bathroom doing her daily chores. Through the wall I heard her singing. For the first time in a long time, my daughter is HAPPY. The texting is continuing, and she is being encouraged and strengthened beyond anything I could have forseen. I am thanking God for sending my daughter a friend that we have prayed for, for the young man's obedience in what God told him to do, and for the young man's mom for raising such a wonderful son.